One of the most iconic hi-fi loudspeakers of the nineteen eighties, the AE1 sits alongside the Celestion SL6 and the Wharfedale Diamond in the great pantheon of boxes that rewrote the rule book. The BBC LS3/5a and Spendor SA1 aside, small speakers of the seventies were few and far between. Indeed, the breed simply hadn’t been taken seriously at all – Spendor’s Philip Swift recalls his earlier professional life in retail where they would sell LS3/5as as “kitchen speakers”, rather than serious substitutes for the larger boxes in the living room! Good sounding small speakers were regarded very much as novelties; they certainly were not the norm. Instead, big and ungainly speakers were ubiquitous. Often three- or four-way, most used fairly crude (by today’s standards) Bextrene, polypropylene or paper cones whose weight sapped efficiency as much as the complex multi-element crossovers. Cabinet quality was generally poor, with insubstantial chipboard coming standard, often poorly damped and veneered in the drab teak wood. Most – not all – seventies speakers had diffuse bass, a coloured midband, curtailed treble and limited dynamic headroom. All of which made the AE1 something of a revelation when it was launched in 1988. From a brand new London-based company, its first product was strikingly different to what we had been used to from mini monitors. Acoustic Energy soon moved to the Cotswolds, as it needed to expand rapidly to meet demand for this remarkable little loudspeaker, and it has remained there ever since. Designed by Phil Jones, now of Phil Jones Pure Sound in the USA, this compact (295x180x255mm) monitor had relatively thick 22mm MDF cabinet walls – at first they came finished in crackle black, the sort of thing you’d see on an MGB dashboard, although later got a range of fancier real wood finishes. The front baffle housed a 25mm SEAS magnesium alloy dome tweeer, which handed over duties to a custom built 90mm ceramic sandwich aluminium alloy cone mid/bass unit at 3kHz. A metal dome tweeter was de rigeur in the eighties, and the ceramic/alloy cone was the stuff of futuristic fantasies – it came from a completely different era to the KEF B110 unit found in the best small speaker of the seventies, the LS3/5a. This drive unit was cutting edge stuff; the straight sided cone was spun from aluminium alloy with a graded thickness across its profile and then hard-anodised black on both sides. As the anodised layers take up one third of the cone’s thickness, it was effectively a sandwich of alumina (aluminium oxide) and aluminium, said to be both stiffer and better damped than a pure metal. The cone shaped dust cap was glued to the cone which is driven by a 1½” aluminium voice-coil former. Unlike the ageing LS3/5a, the cabinet was a bass reflex affair with twin front firing 40mm ports, and fed by a crossover mounted on the rear terminal panel. Like the LS3/5a, it was a complex affair, a third-order design with high quality iron-dust-cored inductors and low-loss polyester capacitors. In this respect, the AE1 went against the received wisdom of the day, which was moving towards minimalist crossover designs that you’d see on the likes of the Epos ES14. The high-tech drive unit materials gave a far higher power handling and vastly improved tracking of dynamics, compared to the LS3/5a. It had a fairly smooth frequency response of 70Hz to 22kHz (+/-3dB) and a high power handling of 200W, almost ten times that of the BBC mini monitor! Its quoted sensitivity was 86dB/1w/1m, much better than the baby Beeb box but still mediocre; it meant that a power solid-state amplifier was needed. Even by today’s standards, the 1988 AE1 is a very good loudspeaker. It has a real rhythmic bounce to it, allied to excellent dynamics for a small speaker – it’s far less likely to sit on transients than any other speaker of its day, for example. Yet it manages to have enough bandwidth to succeed as something that’s more than worthy of being left in the kitchen. The lowest bass guitar notes are lost, but these aside the AE1 sounds surprisingly satisfying as an all round performer considering its size. It’s also very detailed too, with a well etched, precise sound that has far greater transparency than the existing mini monitors of its day. Its excellent phase coherence means all aspects of the frequency spectrum arrive at the listener at the same time, and this explains how the speaker seems to snap everything in the soundstage into focus. Like all good small speakers, it images very well, hanging instruments in space with ease. It also has impressively good stage depth, too. Overall then, this is a great little speaker with a highly propulsive yet transparent sound all of its very own. 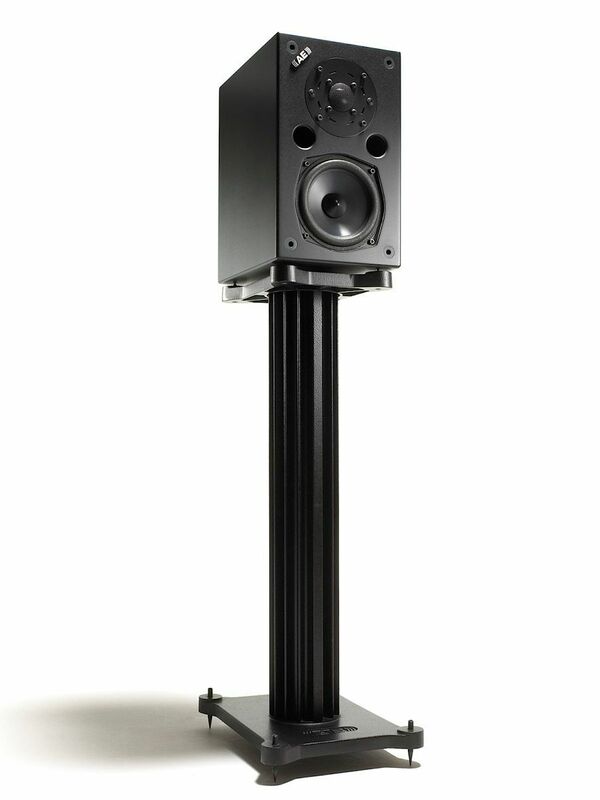 Modern speakers do better at the frequency extremes, but do sound bland by comparison to the AE1. This is certainly a character speaker, and one of the big moments of nineteen eighties in terms of product launches. Because they’ve been around for over a quarter of a century, there are plenty to choose from secondhand – expect to pay between £300 an £700 depending on age, condition and provenance.